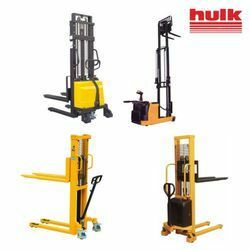 - We are manufacturer and supplier of premium quality Electric Hydraulic Stacker. 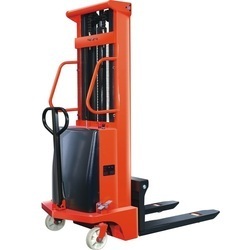 The range of Pallet Stackers offered by us is well known in the domain for its rugged construction, easy operation and long lasting durability. The range is designed to have a raise height of 5000mm and can lift the load weighing from 500kgs to 1500 kgs. The range is made available in battery operated and electric operated models and can be customized as per client specifications. Structure: simplex single mast structure made from heavy duty c channel section. We are the supplier of the Semi Electric Hydraulic Stacker all across India.